Meanwhile, officials said they had checked more vehicles at checkpoints. The government's Road Safety Directing Center stated on Saturday (Apr 12) that there were 969 traffic accidents on Thursday and Friday, falling 5.46% year-on-year, in which 105 people were killed (-12.50%) and 1,001 people were injured (-5.74%). 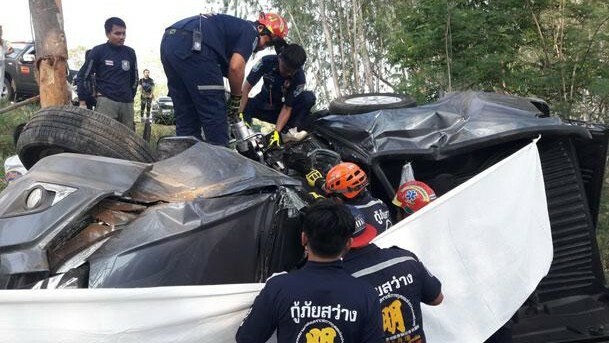 Nakhon Si Thammarat province recorded the highest number of accidents at 43, followed by Chiang Mai (36) and Chiang Rai (35). Lop Buri province showed the highest death toll at seven, followed by six in Nakhon Ratchasima and five in Khon Kaen. The highest number of injured people, 50, was reported in Nakhon Ratchasima, followed by 42 in Nakhon Si Thammarat and 37 in Chiang Mai. Drink driving was the most common cause of the accidents, resulting in 34.88% of the total, followed by speeding (28.48%) and cut-ins (18.27%). Motorcycles were involved in 78.59% of all traffic accidents. Highways were the most common places where the accidents took place, accounting for 40.66% of the total, followed by roads in sub-districts and villages (36.64%). The most common hours of the accidents were from evening to early morning: between 4pm and 8pm, constituting 28.28% of all accidents, followed by from 8pm to midnight (15.58%) and from midnight to 4am (11.97%). The top age range of traffic accident victims was 50 years or more, being involved in 25.50% of all accidents, followed by 20-24 years (14.20%) and 15-19% (12.10%). At checkpoints, officials stopped 1.60 million vehicles for checks, up by 10.91% year-on-year. The National Council for Peace and Order stated that its officials impounded 991 vehicles, 712 of which were motorcycles, from drunk motorists and took legal action against 31,392 traffic rule violators, including 19,158 motorcyclists. The Probation Department said courts ordered probation in 597 cases, including 441 of drink driving, representing 73.9% of the total. Of the drink driving group, 24.6% involved drug abuse. Seen graphics/analyses  over many 'songkran years', death toll + whatever. Why not compare a Songkran week of danger with, for example, a normal thai  road week in June, July, or so? Perhaps it shows that road lawenfocement not only should be done 1 week twice a year in Thailand. How Thailand is going to tackle the enormous non driving license problem? When Thai Government starts that?